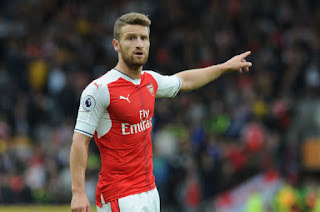 Arsene Wenger has confirmed that Shkodran Mustafi has sustained an injury that will make him miss out of action for at least three weeks. The German international started but could not go beyond the 24th minute after injuring his hamstring. He was replaced by Hector Bellerin. Wenger told newsmen after the match that the 24-year-old defender will not be available for action for a minimum of three weeks. Wenger on Mustafi: "The minimum is 21 days. That means... he will have a nice Christmas." His absence will be a big blow for arsenal who have enjoyed his services since he joined them from Valencia last summer. He will miss clashes against Everton, Manchester City, Westbrom, Crystal Palace and possibly Bournemouth on January 3. If his injury stretches beyond the expected span, then he will be out of our FA Cup third round tie against Preston North End and our league game against Swansea City. Let's pray he recovers fast and return better than he left. Gabriel will stand in for him while he is away.